Bacchanalia, the new shop front incarnation of one-year-old pop-up Bacchanalia Brunch Series by young entrepreneurs Raj Datwani and Alexander Chew, scores a permanent home via the coveted grounds of the historic Masonic Hall on the first floor of the Masonic Club (circa 1879) at Coleman Street. 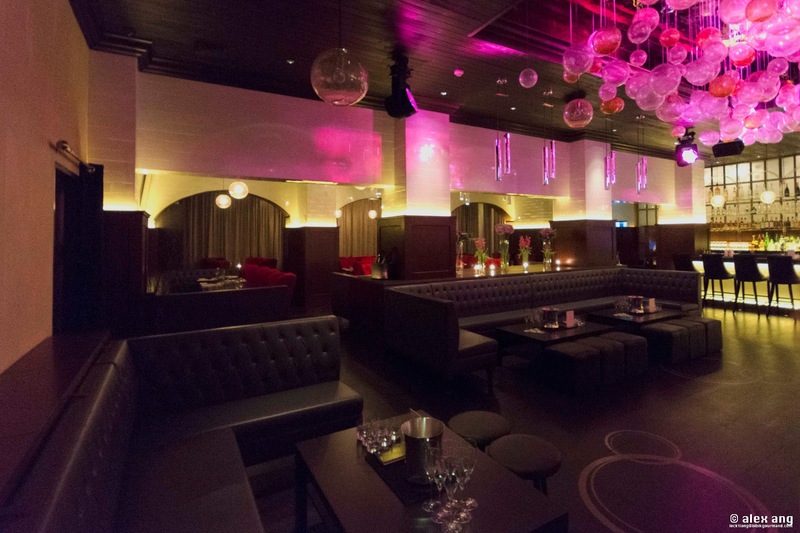 After a makeover, the veil was lifted in April 2013 to reveal a low-lit, sultry space made up of a roomy bar flanked by 2 dining rooms (and a private room) with a total capacity of 150 pax. 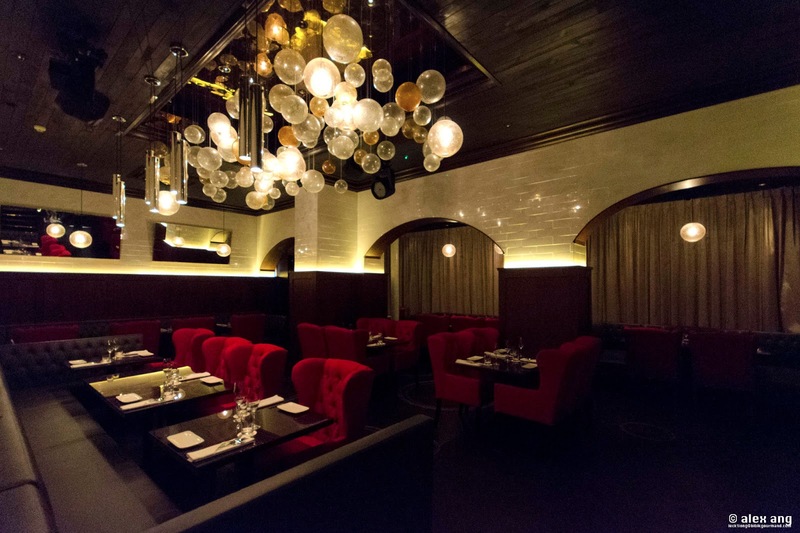 The dark wood paneling, heavy drapes, timber ceiling and mix mesh of leather banquettes and crimson red lounge seats complete the loungy vibes, as do the canopies of Champagne-inspired hand-blown glass bubble lamps that adorn the ceiling. 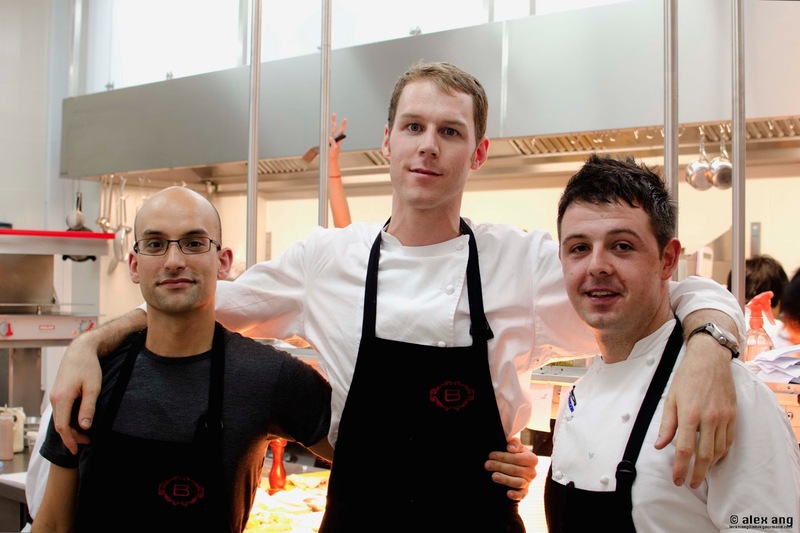 But Bacchanalia’s biggest allure is tucked away in the kitchen: not one but three former chefs from Heston Blumenthal’s Fat Duck empire (and Fat Duck’s research lab) led by head chef, Ivan Brehm; sous chef, Mark Ebbels; and pastry chef, Kostas Papathanasiou. The cryptically-worded modern European small plates menu is spiffy, with dishes like cauliflower gratin, duck confit as well as avocado & lime grouped according to 4 categories: vegetable, seafood, meat and dessert. But not everything on this menu is to be taken at face value. Do you recognise this duck confit dish? Duck confit (S$28++) is served – but not as we know it. 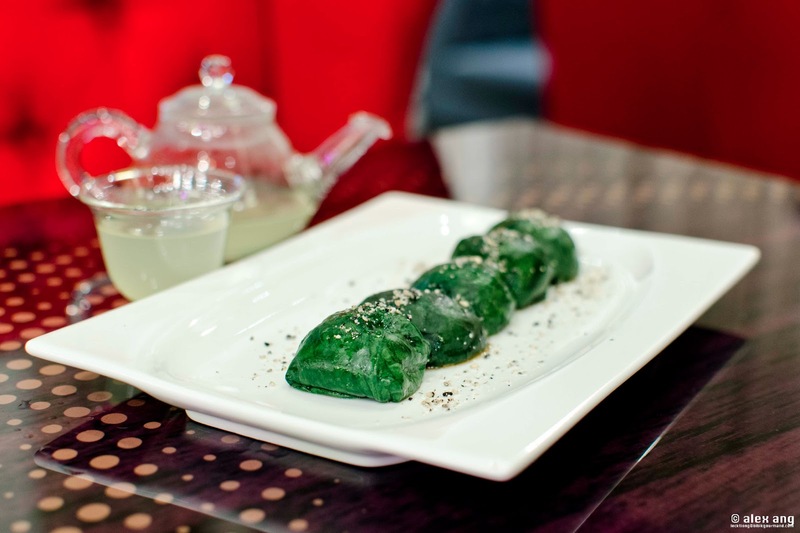 First marinated in Hoisin sauce, then wrapped in spinach leaf and steamed, every bite into the morsel yields a burst of savoury flavours best washed down with the accompanying teapot of corn and cucumber dashi. 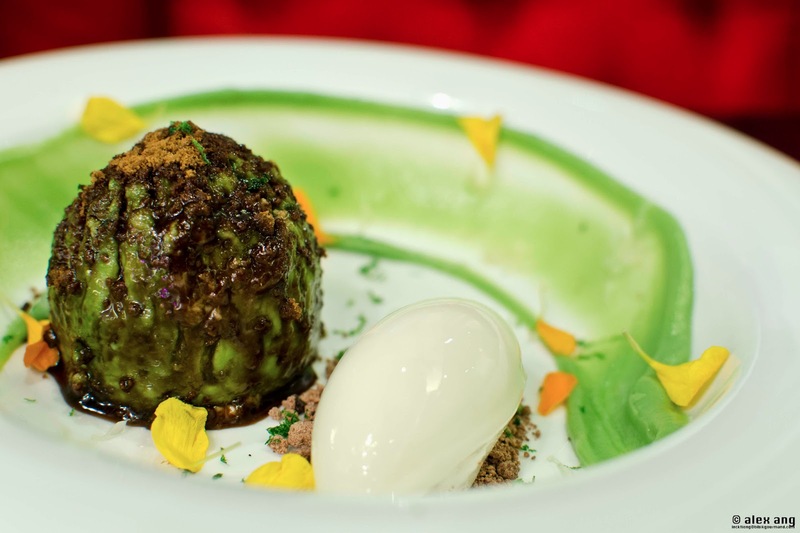 Equally intriguing, the dessert of avocado & lime (S$15) beckons for attention with a caramelized sugarcoated dome of avocado concealing the goat’s cheese cream within. The unusual melding of flavours takes some getting used to and for those who find this cloying, the accompanying lime sorbet comes in handy to refresh the palate. 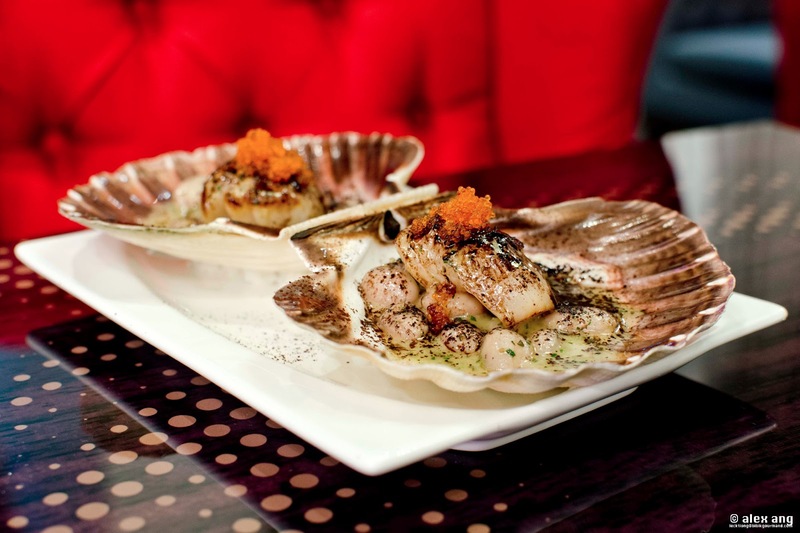 But it’s WYSIWYG with the HD scallops (S$36 for a pair) – the cocoa powder-dusted Norwegian hand-dived scallops are cooked a la plancha, then crowned with tobiko and served – without fanfare – alongside borlotti beans. 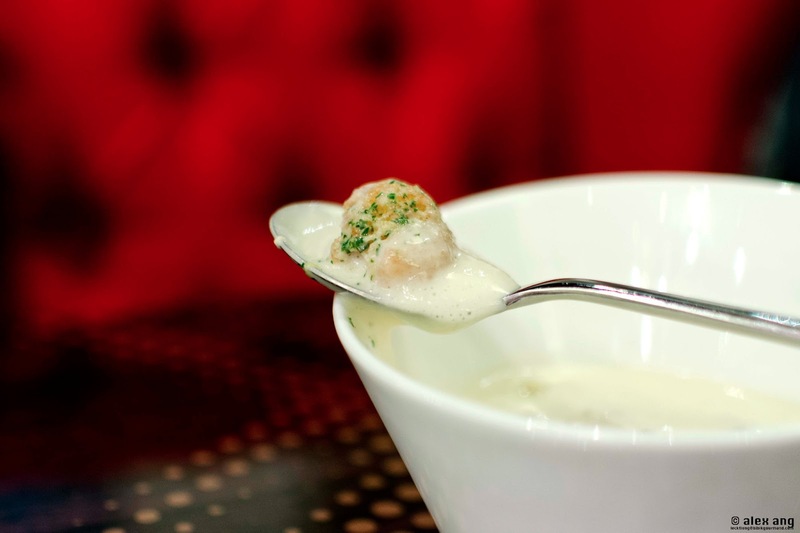 Straddling somewhere in between the ‘safe’ and experimental spectrums, Bacchanalia’s take on cauliflower gratin (S$17) arrives as a white truffle oil-infused creamy cheese emulsion embedded with crispy florets of deep fried cauliflower. Love the cocktails! How do we stop at one? For the complete Bacchanalia experience, the restaurant suggests that you order 3 savoury dishes and one dessert. Throw in a glass of cocktail (try the refreshingly alcoholic Southside, S$18) and your 4-course dinner will cost approximately S$120++ per head. But there’s no guarantee that you’ll stop at the first glass. 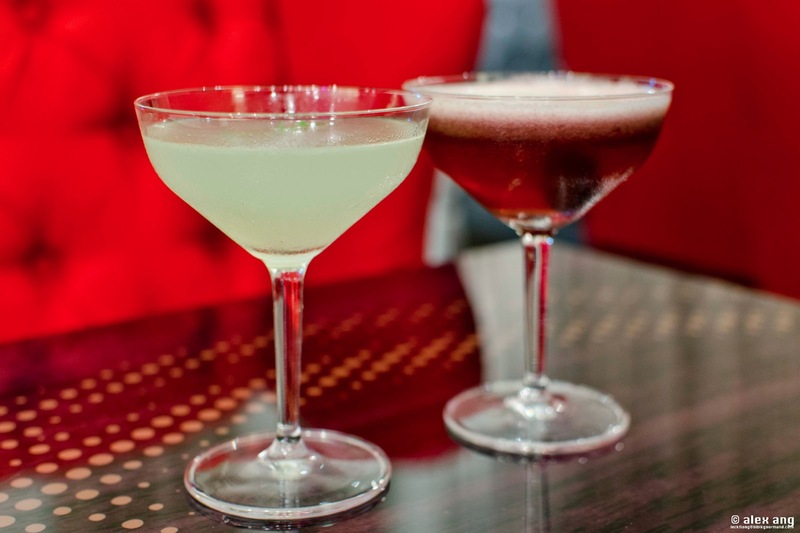 Peruse the drinks list and you’ll be the judge. 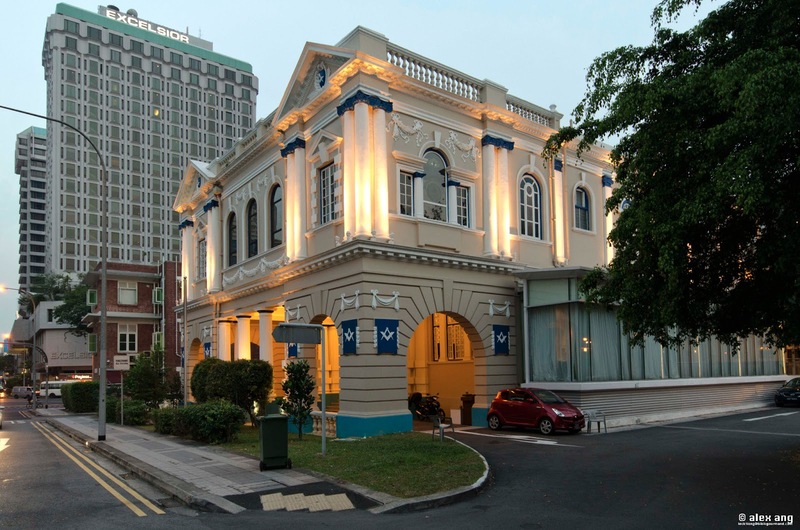 You may also like Singapore’s best tapas / small plates restaurants.